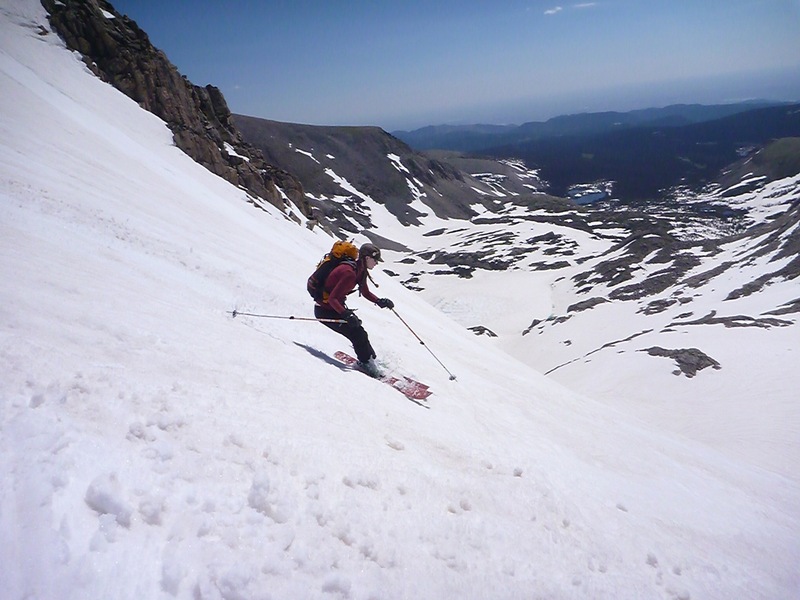 While Apache Peak is undoubtably the crown jewel in the Indian Peaks – it's the highest mountain in the range – for a skier there is a certain right-of-passage to a jaunt to Mount Toll in May and June that defines spring skiing in Boulder County. 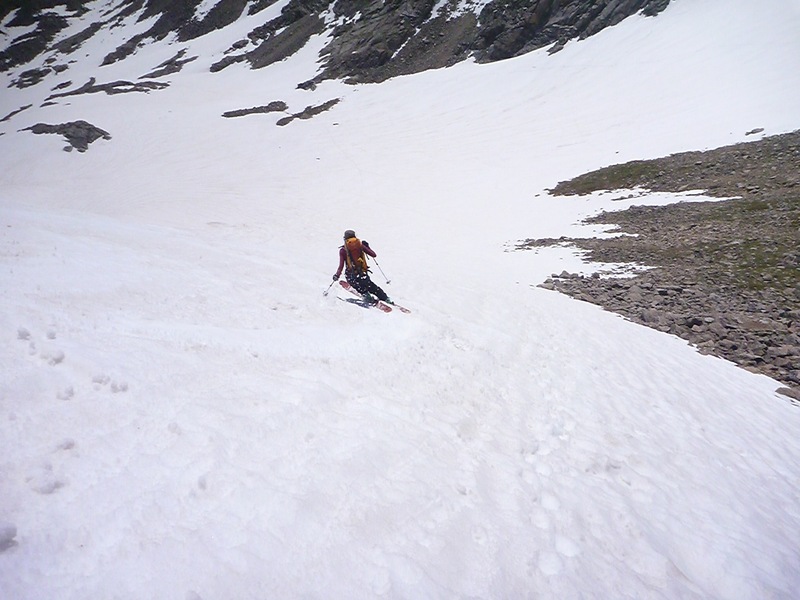 It is the most popular spring skiing destination in the area, and because of this I have often found myself shunning it in favor of more obscure peaks, especially when going out on a weekend where it can often be a veritible zoo (these terms in backcountry skiing are relative…on a very busy day there may be 20-30 people on this mountain making turns…compare that to the hundred-plus mountain bikers who visit West Mag on a weekend day). Nevertheless, there is usually a reason something is popular. 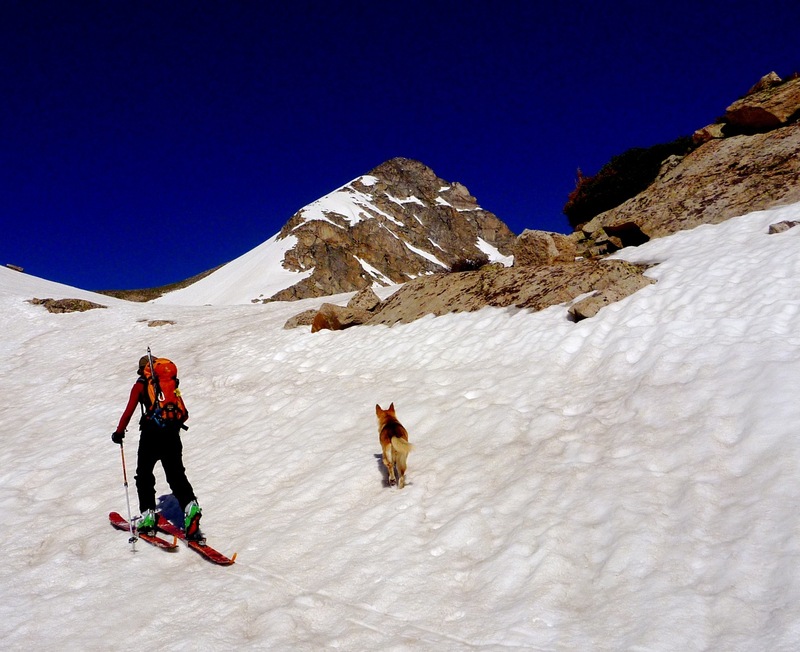 A conical, beautiful peak, a wonderful snowfield, the ability to ski right off the peak, a lake and easy access are something any backcountry skier relishes. 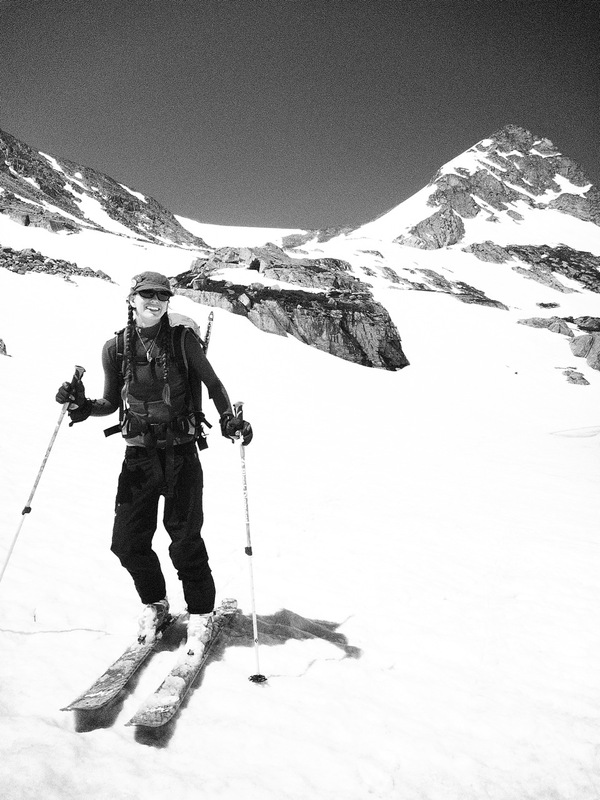 When Elaine asked me recently what my favorite backcountry ski is, it's hard not to put Toll on the top of the list. 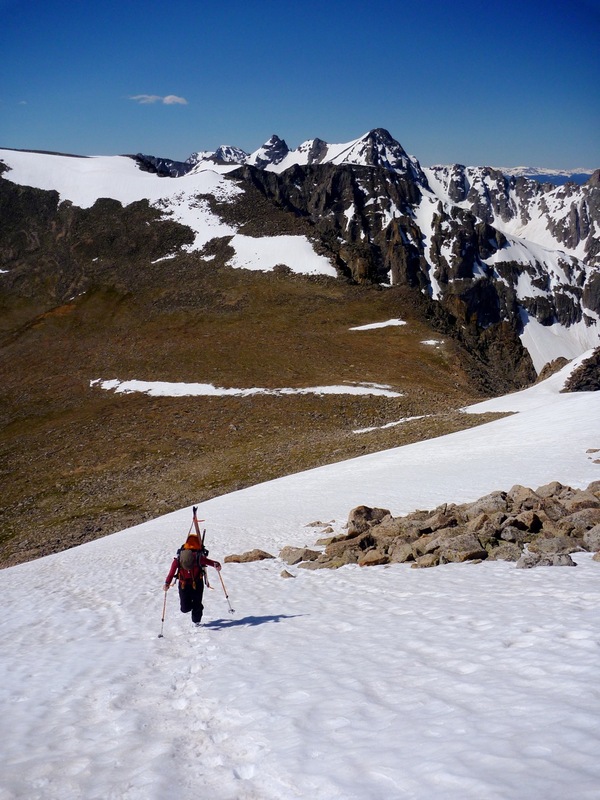 We've intentionally been avoiding the Indian Peaks so as to experience offerings from other ranges and because, simply put, our backyard has more snow than anywhere else in the state. Meaning, most of this stuff will be skiable well into late-July and August and I don't want to burn out on it. So we held off on the peaks until today. How much snow is there? A few years back, on the 4th of July, my parents came out and we hiked in the Long Lake, Lake Isabelle area. Pretty much bone dry that day. Last year Elaine had e-coli sickness, but we managed to get out of the caboose and hike up to Blue Lake, also on the 4th. Again, bone dry. This year was a completely different story. The snow is deep, and it starts right at the trailhead. It's not just drifts…it's deep snow, all the way, unrelenting. A ranger at the entrance gate told us of a couple last week who showed up in flip-flops. The guy ended up cutting up his Gore-tex jacket to wrap around his girlfriends feet because they were getting cut-up and frozen by the snow. It's going to be ugly up there next Tuesday, because I honestly think folks from the flatlands don't believe there is that much snow up there or are simply in denial. It's like nothing I've seen since moving to the area. Of course there was no trail, but I know this route well. We followed a loose route and then bushwhacked our way up past Mitchell Lake. The snow had frozen solid last night and the going was easy. 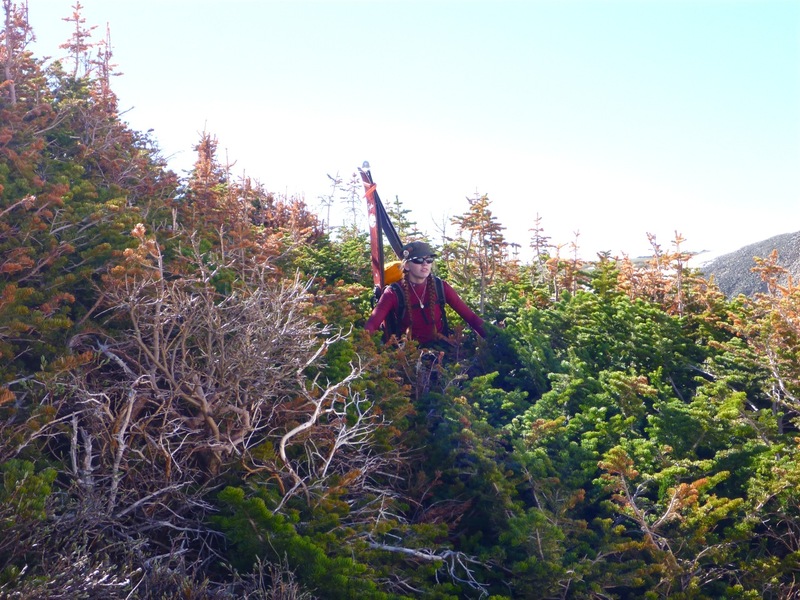 A few times we ended up in rivulettes and pine groves, but these are part of the adventure. Elaine and I talked a bunch about our early outdoor experiences, and the subject of Boy Scouts and Girl Scouts arose. Elaine was a Girl Scout in the local troop and was fortunate to have a leader who was into actually doing stuff, not just selling cookies. They hiked Mount Elbert, went to Fish and Owl Creek Canyon and did lots of good things to develop a future outdoors woman. I was a Boy Scout for awhile as well. My dad was in the army, and we were living in Greece when I started Scouts. 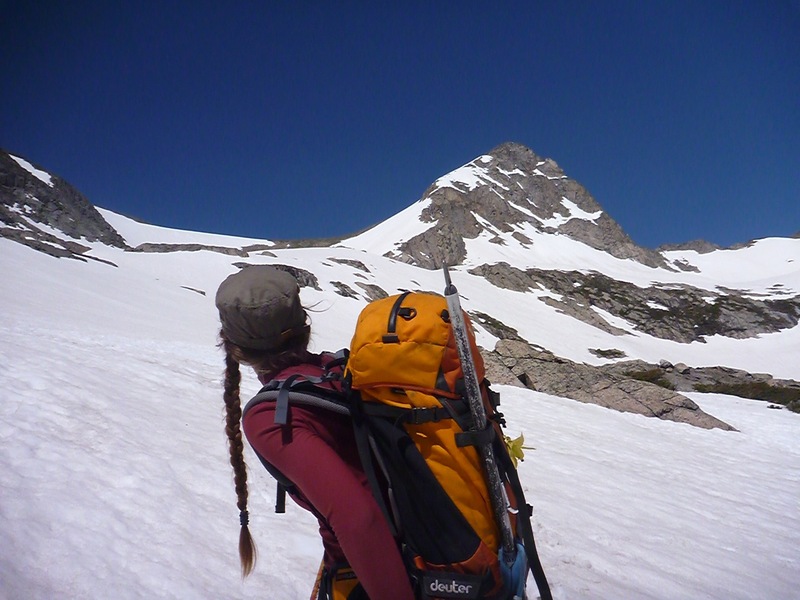 My memories of this time are spotty, but I do remember a backpacking trip in the winter where a foot of snow fell. This was unheard of in Greece and I remember tents collapsing and general chaos. I remember the leaders of the group were fairly frazzled. I of course loved the whole affair – my love for snow started early in my life and even living in a Mediteranean climate did nothing to squash it. We later moved for a couple years to – of all places – Dickinson, North Dakota. It was hard fitting in here, and honestly the geography didn't appeal to me all that well – it was dead flat. My folks used to load up the car on Friday after work and drive eight hours across Montana to the closest good skiing – Red Lodge. More than once the trip was cancelled because of ground blizzard conditions. I didn't like being so far from skiing, but I thank my parents for these epic trips. They kept me skiing and paved the way for me later in life. Anyway, I was in a Boy Scout troop around this time. There was this place called Theodore Roosevelt National Park – part of the Badlands – and I remember some backpacking trips with my troop in this gnarled land of mesas and buttes. It was cool country – country for the imagination. Around this time my mom and dad somehow procured the entire unabriged Lewis and Clark Journals and I read them, cover to cover – all seven volumes. Pretty unusual for a 12-year old I think. I loved adventure, and I was kind of a loner with a very vivid imagination, so it wasn't much of a stretch for me to imagine I was Lewis and Clark on these early backpacking trips. They of course passed through this country on their way to the Pacific Ocean. I remember I had a sweet LL Bean 4-season tent – quite expensive – and it was my domain. When I was in that tent, I was an adventurer, exploring far-off lands, new horizons. I still distinctly remember a cold November night with that troop, camped out on a high mesa in my LL Bean tent, and waking up to a fresh coat of snow. It was a great moment in my young life. My interest in the troop fizzled as they became more-and-more focused on earning merit badges. I just wanted to go backpacking and go on adventures. One summer there was a camp in Minnesota, and the troop leader made it clear that the emphasis was for all of us to earn as many merit badges as possible. I was luke warm about the camp at best. When I got to the camp they had us all meet in a big tent where we were to sign up for various merit badge classes – citizenship, archery, religion, etc. While wandering around, I found a booth with a 20-something year old guy simply labeled backpacking. The proposal appealed to me – instead of spending the five days at camp earning merit badges and such, he was going to take Scouts on a five day backpacking trip into the heart of the Minnesota wilderness. I knew our Scout Master would not be happy, but I didn't care. I signed up for that backpacking trip. I got criticized by our leader for "wasting a valuable opportunity" but nevetheless, the next morning myself, one other student two or three years older, and the 20-something year old guy were off into the wild. It was hard work. The packs were old frame packs and I think we were carrying cast iron skillets for cooking. I remember one day – it must have been 95° with 95% humidity where we hiked 20 miles in a day – that still stands out as one of the most brutal outdoor experiences I have ever embarked on. But the thing was – I loved it. I loved the challenge, the feeling of utter exhaustion. I loved the wild and the woods. When I got back I had more of a sense of accomplishent and pride than any merit badge could ever provide. 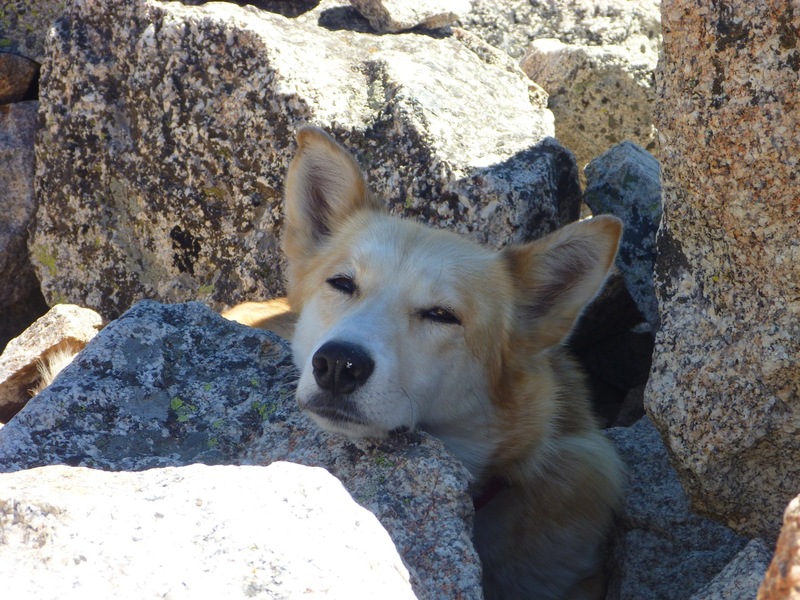 I remember the other kids – there was almost an awe that I did the backpacking trip. I felt a lot of pride. I never was much of a scout, at least in terms of ranks and all that. I think I earned the First Class rank and decided that was plenty good enough for me. After all, there were mountains to ski, baseball games to play in, and trails behind our house that needed to be explored on my bicycle. 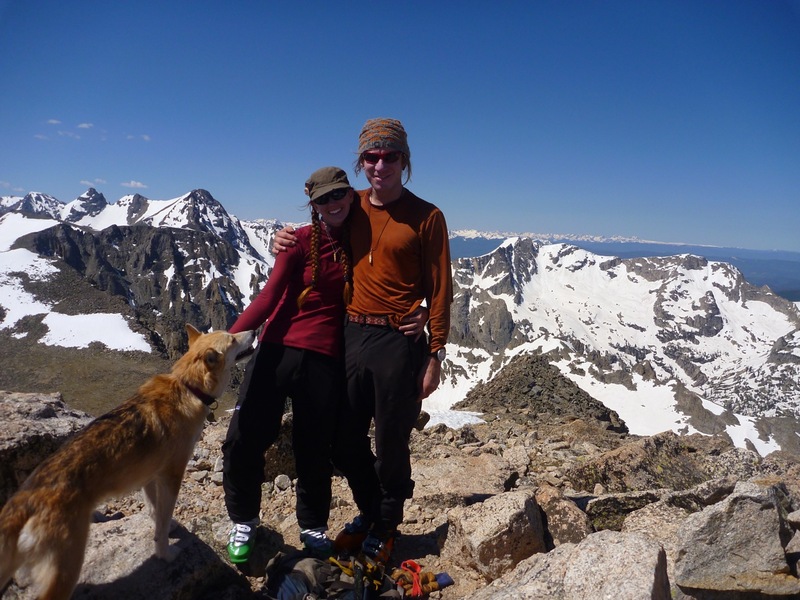 Still, looking back, it's fairly obvious that those early scouting trips were a precursor to this life I have now where – after my wife and family – the outdoors and the mountains are priority number one. Elaine and I shared our stories while moving ever up. 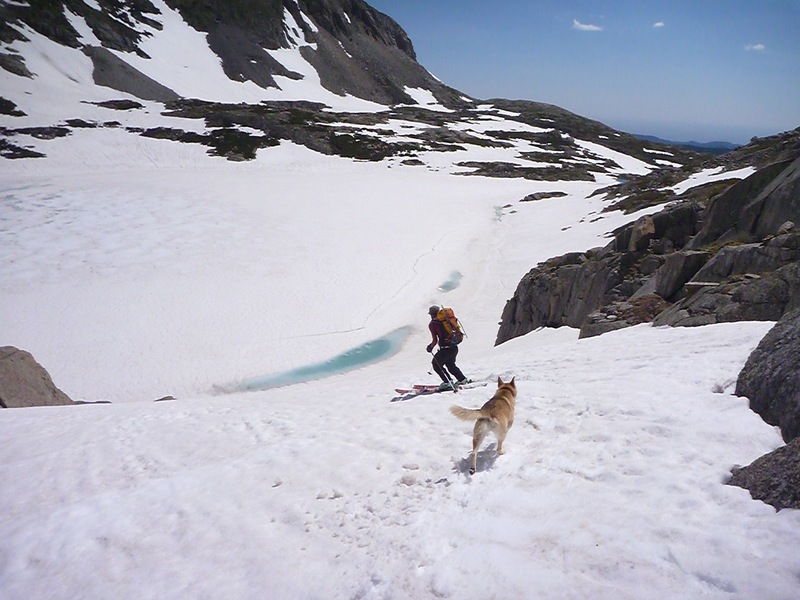 At Blue Lake we put on the ski crampons and worked our way up the lower slopes of Toll. 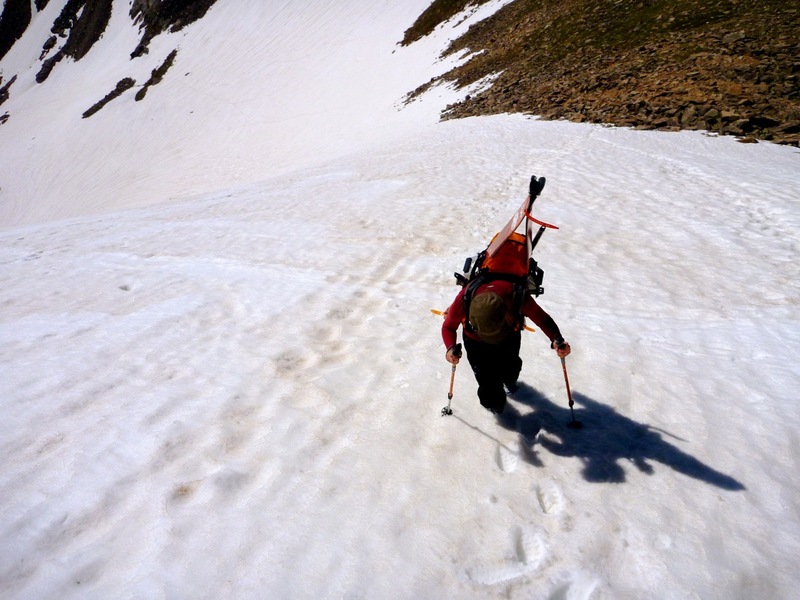 It was hard day – the heat was oppressive even up here – but we kept moving. I let Elaine lead the way. I have climbed most of these peaks and I have experienced the thrill of being the pathfinder, of reaching the summit first. I think, right now, it's important to let her have that experience, to be the first one to crest the summit. There is a power to that that is undeniable. Halfway up the face of Toll we strapped our skis to our packs and booted up the stairway to heaven. Before we knew it, we were at the top. It was a perfect summit day – not a breath of wind and warm – and in all honesty could have spent the whole day up there. But alas, the sun was doing its thing and the snow was softening rapidly and it was time to ski down. The turns were perfect – outstanding, smooth, velvety corn. We took turns leading, with Stella running in a dead sprint behind. There is something about the Mount Toll cirque that feels huge, and Elaine expressed as much to me. It's a humbling place where it feels good to feel small next to nature. A little further down and Elaine commented how some of the best skiing in her life has happened, oddly enough, this June. That's the magic of spring skiing – it combines the beauty of skiing with the solitude of backpacking and the granduer of the big mountains. Because of this it is, I believe, the greatest sport in the world. We slogged it back to the trailhead – home at 1 pm – and have spent the rest of this hot summer day lounging in the caboose – reading, writing, listening to music, drinking iced tea (Monday and Tuesday are our weekend). A lazy day, enjoyed as a result of climbing mountains and sliding down them on snow. Today is the latest sunset of the year. In 15 minutes it will drop below the horizon, and it will not be up again this late for another 365 days. The cycle of life, the cycle of the seasons – never ending and always awe inspiring. Well put! Toll is classic for good reason! Love the pics, I have fond memories of Toll!